Thousands of people have put pressure on their mobile manufacturers to answer questions about the tin used in their phones, and five global companies have committed to take action to tackle the issue of illegal and environmentally destructive tin. Nokia, Sony, Blackberry, Motorola and LG Electronics have publicly accepted that their phones likely contain tin that is destroying tropical forests, killing coral and affecting communities in Indonesia. This comes as a response to an investigation run by Friends of the Earth, a grassroots environmental network. 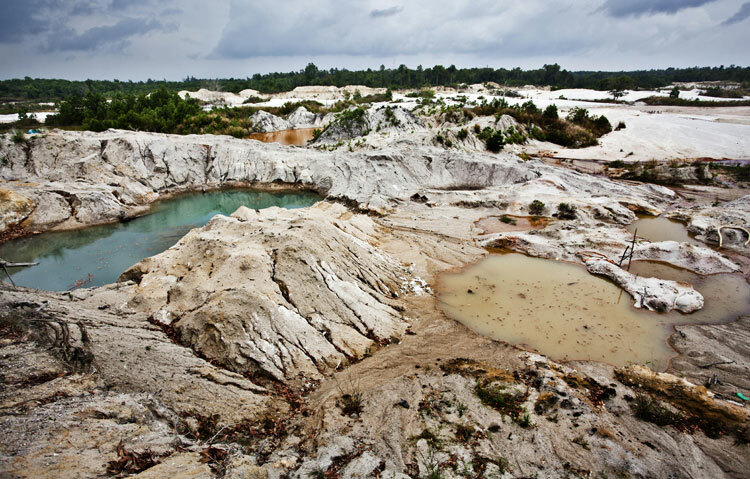 Approximately a third of the world’s mined tin coming from Bangka and neighboring island Belitung. Concerns about the mining include dangerous and unregulated conditions, threatened coral and sea life, and the loss of farmland and forest. The campaign is pointing to the need for a new European law for companies to report on human and environmental impacts of their operations. Apple is the only company left among the best-known brands to not provide a straight answer to the question of sourcing tin from Bangka Island. More than 25,000 Friends of the Earth supporters have emailed Apple about the tin in their products. 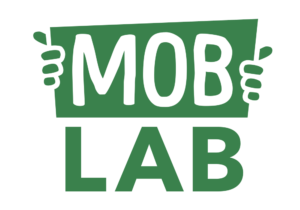 The Janaagraha Centre for Citizenship and Democracy has created a website, ipaidabribe.com, to tackle corruption through the collective energy of citizens. Citizens can report the nature, number, pattern, types, location, frequency and values of corrupt acts happening in their city by visiting the website. The reports will be used to argue for improved governance systems and procedures and tightening law enforcement and regulation, to reduce the scope for corruption in obtaining services from the government. Citizens are invited to register recent or old bribes they have paid. With 30 per cent of Cambodia’s population being between 15-24 years old, it is Southeast Asia’s youngest country. The recent election campaign saw more participation of young people as more have access to the Internet, using social networking sites like Facebook. Though only five per cent of Cambodia’s population are Internet users, there are an estimated 740,000 Facebook accounts from the country. The recently-founded Cambodian National Rescue Party and ruling Cambodian People’s Party both provided updates on Facebook pages. Facebook was an independent news and information outlet for the country’s voters, providing a platform without the same regulations as the largely state-controlled media. Social media is a way for people to share accounts that may be censored by the state’s media, and political parties use it to organize with more efficiency. Six Greenpeace activists scaled Western Europe’s tallest building, the Shard, in London to protest oil producer Royal Dutch Shell’s plans to drill in the Arctic Circle. The 16-hour climb started from the roof of the London Bridge station, with the goal of unrolling scenic Arctic posters within view of Shell’s three London offices. One banner, reading “Save the Arctic,” was successfully unfurled during the July 11 climb. Due to the length of time the climb took, the other banners were not unveiled. 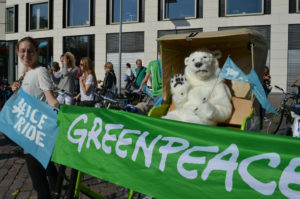 The act received media attention and Greenpeace had a live video stream visited by more than 13,000 people. The Association ActionAid Mozambique launched a Tax Justice campaign July 3. Tax incentives given by the country’s government to mega-projects in Mozambique have cost public coffers approximately $163,701,400 US per year. The campaign is advocating that the government create a progressive tax collection system for mega-projects, with the revenues from these projects used in a fair way for the needs of the poor and vulnerable. The Tax Justice campaign also seeks to raise citizen awareness about compliance with tax obligations, to help ensure the government collects more revenue and citizens can monitor the transparency and fairness of the system. As part of its campaign, an online video describes the tax system issues, which — thanks to captioning options — can be translated into different languages. 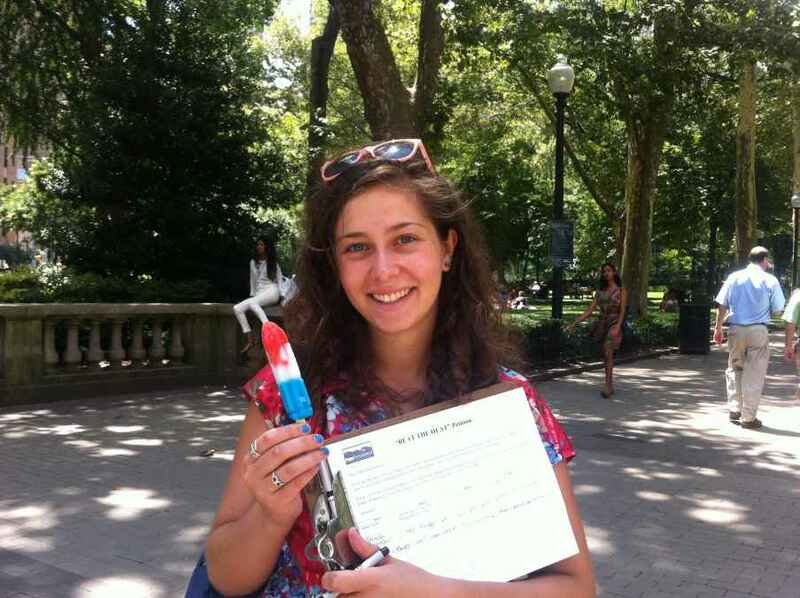 PennEnvironment, a citizen-based Pennsylvania environmental advocacy organization, decided to make the most of the recent record-breaking heat waves and offer popsicles while informing people about the need to cut global warming. People were asked to sign a petition that asks President Obama to move forward on this climate change action plan. Those who signed were asked to write a message on the Popsicle sticks about the impact of global warming. PennEnvironment intends to present the sticks to the President.